Anyone at least 18 years of age can make a will in Massachusetts if he is of sound mind. Requirements regarding witnesses can vary depending on the circumstances of the will. A will is not made invalid by the inability of the testator, or the person who made it, to sign her name. Massachusetts’ statutes contain provisions for that eventuality. In Massachusetts, a will must be in written form and be signed by the testator to be legal. Generally, his signature should be at the end of the document. Some attorneys also prefer to have him initial each page to prove the legitimacy of each one, but initialing each page is not a legal requirement. If the testator is unable to sign her own name, she can have someone else do it for her as long as it is not one of the witnesses to the will. She must state in the presence of the witnesses that she is requesting a representative to sign for her, and the representative must include his own name on the document with a notation that he did this on the testator’s behalf. Massachusetts requires two witnesses to a will and they must sign it in the testator’s presence. If one of the witnesses is a beneficiary under the terms of the will, or if her spouse is, her bequest is voided by the act of witnessing the will unless an additional witness signs who is not a beneficiary. The will must be signed by at least two disinterested witnesses. Massachusetts does not accept holographic wills that are handwritten and unwitnessed. However, handwritten wills are legal if they are witnessed and signed by a sufficient number of people to meet all the witness requirements. Self-proved wills are legal in Massachusetts. A self-proved will is one that includes a separate notarized statement by the testator and her witnesses that the will is legitimate. The additional statement allows the probate court to validate the will immediately when it is submitted for probate without proving it by having the witnesses appear in court to give testimony that they were there at the signing. If you have a self-proved will, four or more additional signatures are required: the notary’s, your own and the signatures of two witnesses who have no financial interest in your estate in addition to any witness who might also be a beneficiary. Boston Estate Planning: Are Handwritten Wills Valid in Massachusetts? Bird, Beverly. "Massachusetts Last Will & Testament Signature Requirements." 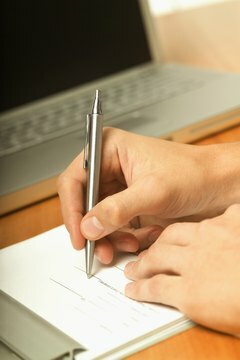 , https://legalbeagle.com/4581-massachusetts-last-testament-signature-requirements.html. Accessed 21 April 2019.